Most of us probably know a woman who has undergone a mastectomy or a lumpectomy that was so deep it left her breast permanently misshapen. Most of us probably don’t think about how expensive, heavy, and uncomfortable traditional breast prosthetics can be. Knitted Knockers offers a perfect solution to this problem: crocheted and knitted knockers. Handmade knockers are soft, light, and very comfortable. They can even be used in a regular bra, taking on the shape and feel of a real breast. They can be stuffed a little or a lot, depending on the woman’s preference. They can be used to replace the look of a complete breast or used to fill the gap in a breast that is left uneven from the other breast. Knitted Knockers are provided for free to any woman who wants a set (or even just one). As the organization gets more and more publicity, the demand is growing, growing, growing. More and more people are needed to help make and distribute Knitted Knockers. Crochetville is stepping up to the plate to be a collection point and a distribution point to clinics and support groups in the greater Huntsville/Madison area of north Alabama. We invite all of our forum members and Facebook page fans to consider making some knockers and then sending them our way. If you are local to the north Alabama area, you are invited to join us for monthly meetings to stitch and stuff knockers. These don’t take long to make. You’ll be able to complete a pair during our meeting. Keep reading for information on how you can help Crochetville help women in need of affordable, comfortable breast prostheses! 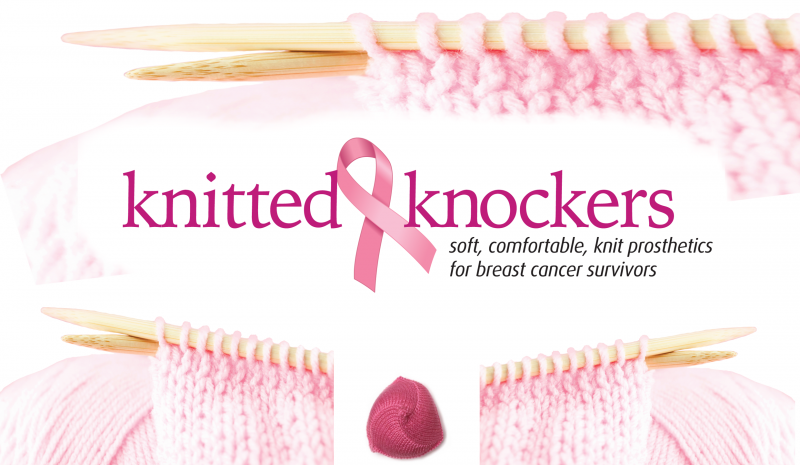 The Knitted Knockers organization prefers that everyone use their approved patterns and yarns to make the knockers. One thing to remember when making crocheted knockers: they are thicker than knitted knockers, so it’s very important to use a soft yarn no heavier than DK / #3 weight. Check out this fabulous video to see the home office’s weekly meeting to log in, stuff, and distribute the knitted knockers they receive. I gave two of those to a survivor a few years ago while she was still having radiation and all. One was about her skin color, the other...er...wasn't. She got a kick out of going around with a rainbow-striped knitted knocker! (She went to her surgeon after all her chemo and radiation appointments--she was Stage III to begin with--and the surgeon asked if he could bring in a student. She agreed, so he showed the student in. "Mr.Jones, this is Mrs.Smith. She used to have cancer." That was how he told her she had the all-clear! I used to have a pattern for crocheted knockers. I'll see if I can find it, and get my "Froggers" to make up some! What a wonderful story! The parent organization says most of the requests are for fairly normal shades of skin color, but every now and then they get requests from people who want bright and vibrant to celebrate! That would be great to get your Froggers involved. If you want to send these in to Crochetville or Knitted Knockers parent organization, be sure to use their pattern that I linked up in my first post. If you want to just make them for your community or for something else, then definitely use any pattern that you like. The Knitted Knockers crochet pattern was recently revised. So if anyone downoaded it from their site more than a couple months ago, you probably want to go back and download the revised version. I hear it's much easier to understand than the original version. The revised version is very easy to follow.